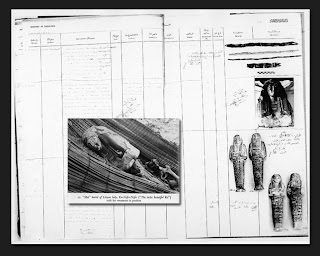 The "factual allegations" note that the mask was excavated at Saqqara. In or about 1952, the Mask of Ka-Nefer-Nefer was discovered during an excavation of the unfinished Step Pyramid of the Third Dynasty ruler Sekhemkhet on the Saqqara necropolis. The excavator was Mohammed Zakaria Goneim (“Goneim”). In the early 1960s, the Mask was a part of the Kaloterna (or Kaliterna) private collection, during which time it was purchased by Ms. Zuzi Jelinek (“Jelinek”), a Croatian collector in Switzerland. In or around 1995, Jelinek sold the Mask to Phoenix Ancient Art, S.A. of Geneva ("Phoenix"). On or about April 3, 1998, the Museum purchased the Mask from Phoenix. It is interesting to observe that the "factual allegation" is unable to be sure about the correct name of the Kaloterna / Kaliterna collection. The fact is that Ms Jelinek appears to have "sold" the mask to Phoenix Ancient Art, S.A. in 1995. For the next two years it appears to have resided in North America. It would be interesting to see the full set of authenticated documents for the period covering the period from 1952 to 1995. It would be inappropriate to speculate on why SLAM has chosen this moment to serve the legal papers. David I think you are correct to point out the unfortunate timing of the declaratory judgment suit by the Museum. However it is very likely that the Museum decided to initiate the suit before the Egyptian revolution. The protests in Egypt began on January 25, just under two weeks after the U.S. Attorneys threatened to bring a forfeiture claim against the Museum. Irrespective of when the suit was brought, the Museum has opened itself up to criticism of this sort, which it apparently feels is outweighed by precluding a forfeiture suite by the U.S. government. I presume that (paid) U.S. Attorneys can be asked to put things on hold ... so it looks as if SLAM has pressed ahead irrespective of the negative PR implications.